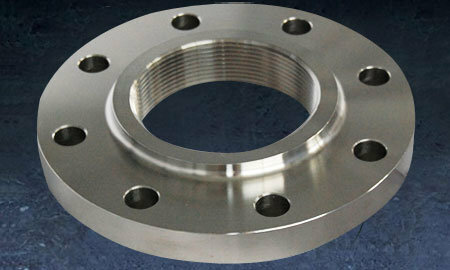 Threaded Flanges Manufacturers, Suppliers and Exporters of india. We are specialised manufacturer of high standard quality of threaded flanges. They are extensively used in piping systems with low pressure, as no welding is concerned while joining these flanges to the pipes or other tools. These Threaded Flanges clearly restrict its application to comparatively low pressure piping systems. In short, these Flanges are used to join other threaded parts in low pressure and non-critical applications. On the other hand, these flanges might perhaps be welded around the joint after an assemblage, but is not being measured as a suitable means of increasing its functions. These flanges can be connected to the pipe devoid of any welding and is being applicable in very hot-tempered areas where welding is dangerous. Also known as screwed flanges, threaded flanges are quite similar to slip-on flanges in its outline, but the bore is threaded to allow assemble without weld. Threaded pipe flanges are more often than not used by means of the pipes which has exterior threads. Used in different applications industry and available in different sizes, grades, thickness and specifications, these flanges are being offered at leading market prices.